Your natural teeth are always your best option. Drs. Werkmeister and Zavoral are specialists and have advanced treatment options available to help you save your natural teeth. Dental implants are the preferred treatment method for replacing missing teeth. 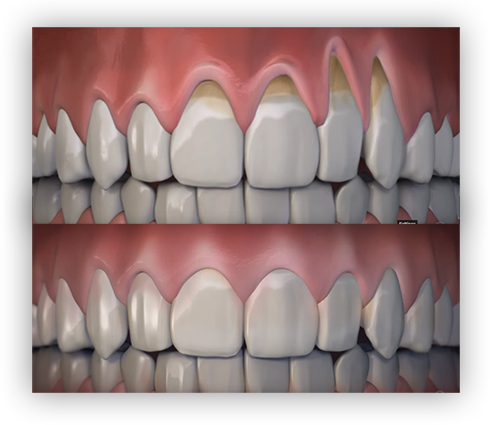 Gum recession not only ages your smile, it creates painful sensitivity to temperatures and sweets. New, Minimally Invasive Techniques allow Dr. Werkmeister to correct your smile with precision and faster healing times. As periodontists, Dr. James Werkmeister and Dr. Jennifer Zavoral, are gum specialists focused on the prevention, diagnosis and treatment of periodontal (gum) disease. Additionally, they have advanced training and expertise in the placement of dental implants and cosmetic gum treatments. x-rays to get a free second opinion. As periodontists, Dr. James Werkmeister and Dr. Jennifer Zavoral, are specialists in the prevention, diagnosis and treatment of periodontal (gum) disease. Additionally, they have advanced training and expertise in the placement of dental implants and cosmetic gum treatments. If you have been referred to our office by your family dentist, it is very likely that your gum disease is beyond the stage where it can be managed without a specialist. Over 75% of all adult tooth loss is due to gum disease. Dr. Werkmeister made me feel so comfortable about having a gum graft. He explained the procedure clearly and answered all my questions. He even called me right after my procedure to see how I was doing. It really showed the care. Thank you! Office staff is also wonderful. Always pleasant and helpful. Had a great visit/appointment with a fun, professional, and kind staff. I recommend these folks wholeheartedly. I really appreciated the courtesy and friendliness amidst no-nonsense professionalism from top to bottom, beginning to end. The entire staff was extremely friendly, helpful and pleasant as my son had to have surgery. As a parent of a special needs child, it was extremely important to me that the doctors and nurses were aware of his needs and took them into account as they worked with him. This was absolutely a great experience as everyone made an unpleasant situation go very smoothly and stress free for my son which then helped me feel relieved. Dr. Werkmeister & staff explained everything thoroughly, so I knew what to expect for the procedure & recovery. I felt comfortable asking questions. I went to two other periodontists before seeing Dr. Werkmeister. I felt comfortable with Dr. Werkmeister's level of experience and proposed treatment plan, in comparison. I was also impressed with the staff. Dr. Werkmeister and his staff were very kind and caring. Very kind staff and Dr. Werkmeister was kind and even took my call on a Sunday! I felt very comfortable and I am usually very anxious about dentistry. I would highly recommend them!